A few things to keep in mind when selecting a size: I'm wearing a Small and because the jeans have virtually 0️⃣ stretch, they fit me quite snug. If you're tryna catch the cozy and cute wave, my recommendation would be to order a size up. If you're more interested in showing off your assets like the classic mom jeans fit intended, order your typical size. Not sure how turn heads in these 💔Heartbreakers? Lemme help you with a few suggestions, bae. • Get red-y. 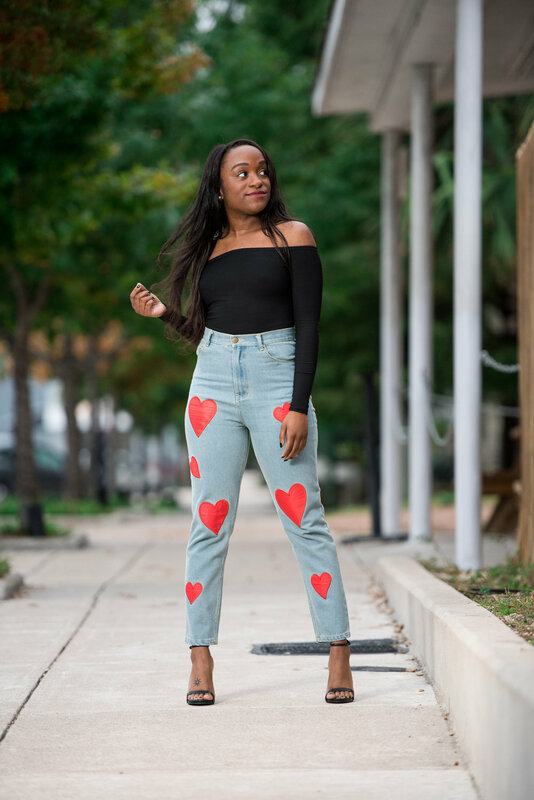 These poppin' jeans already add major color to any look, but nothing's wrong with a sprinkle of some more. Add a bold handbag like this velvet clutch from Kate Spade for an additional rush of rouge. • Keep things bootie-licious.👢 Pair this season's trending white bootie, like this pair from Public Desire, with these jeans to channel even more vintage vibes. • Get bodied.💋 Since these jeans fit a lil close, opt for a simple bodysuit like this one from Naked Wardrobe to keep your look form-flattering and sessy. Remember when I mentioned some ***big announcements*** up there? ☝🏾Well, for starters, I've been doing a lil modeling for one of my rising favorite e-boutqiues, Whistle & Wild. If you're looking for boho-chic vibes, W+W is the place. Be sure to pop back on le blog this weekend to pree some looks from my shoot with Rebecca and Josh of Mira Visu Photography for the shop!